The winner of Sock Architecture is SusanKnits! Congrats to Susan!! NOT SO! I’m an above average knitter, but not by much. We each have our gifts, we each do different things well, and other things not so well. There are a LOT of things that I don’t do so well. So many, many ways to improve, all of them fun in their own way! We knit to make ourselves HAPPY! So CONGRATULATIONS Susan! Enjoy your eBook, and for the rest of you – you can find the book here! 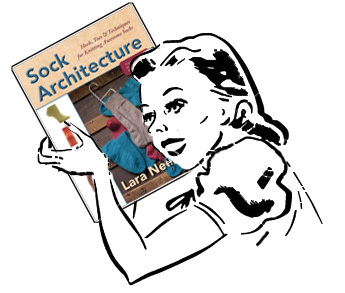 AND – I’ll be reviewing a new book in a few days, this one for the DYERS out there! What a great thought (the one at the end)! Actually, a few great thoughts! Thanks for the contests you run, and the thoughts you share.